The Cantinas Foundation in association with Dream Label Group has announced the winner of the 3rd Annual Cantinas Christian Song Search. The winner, Ryan Kennedy was chosen from a pool of hundreds of contestants nationwide, winning an all-expense-paid trip to perform his winning song, “No Other King,” at the California Mid-State Fair and open for headlining band MercyMe. Ryan was also awarded a $2000 cash prize on stage prior to the sold out concert. Additionally, plans are underway to record the winning song with a leading Christian music producer through Cantinas Music & then marketed with the Dream Label Group. 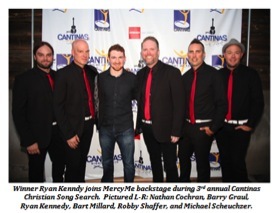 Ryan was selected by a panel of judges featuring Michael W. Smith, the Cantinas Foundation, and Dream Label Group. To enter the contest, songwriters submitted a video recording of an original song to cantinasmusic.com. Ryan Kennedy is a songwriter and worship leader from Houston, Texas, and is currently the Director of Worship and Creative Arts at Northwest Bible Church in Spring, Texas. Ryan has toured with and opened for his mentor and two-time Grammy nominee Sarah Kelly, Jonathan Thulin, Highlands Worship, & Christy Nockels. Even at his young age, Ryan has an unstoppable passion to see the gospel of Jesus infiltrate and impact our culture. Just a few years ago, he personally experienced the life changing love of Christ and surrendered his life to God’s calling. Cantinas Foundation is a 501 ( c)(3) organization that strives to provide opportunities for Christian leaders to be change agents that can touch lives through concerts, music festivals, community service outreaches, cutting edge technology, and the non-profit funding of music, theatre, art, dance, and media that the entire family can enjoy. Founded in 2004, by California natives and philanthropists, Wayne B. Hughes, Jr. and his wife Wendy Hughes, the Cantinas Foundation entails many facets including the Celebration of the Arts workshops, the In the Word Bible Study program, and the newly formed Cantinas Dance Project. DREAM RECORDS approach and model is to not only sign and develop artist in the traditional manner of promoting an artist to the top of the traditional music industry and market – but also not forgetting about the church-based artist and developing a solid foundation of artist that are called, committed and targeted to reach their local, regional and world markets. Regardless of the genre, DREAM is very certain of their purpose and calling… and that is to develop, train, mentor, release, promote and market world-class “Music Missionaries”. For more information, please visit www.cantinas.org.